THE SYRACUSE PANEL DISCUSSION: Highlights include hearing Marc Morano explain why he wears make up, stating that he is not now nor ever been a card-carrying member of any environmental group, and hearing a graduate student at the end take off on the sort of lecture from an audience member that is the bane of every moderator. WARNING: the microphone they put on me was bad news (distorting) so you may want to lower the volume when I talk (sorry). I asked who. He had no clue. But with an iPhone he was able to look at their website and innocently read us the name — Marc Morano. I about did a spit take with my after dinner espresso and explained to everyone that Marc is a major character in my movie. Three emails later, I had set up for him to join us for the post-screening panel discussion of the movie the next night. The panel also included Ruth Yanai and Mark Meisner, both of SUNY-ESF. So … I have been repeatedly criticized by certain scientists and environmentalists for “giving a forum” to climate skeptics, and Morano in particular. I’d be more than happy to debate the principles of why I feel I’m doing a service to the environmental community by allowing people to get a better understanding of who he is and how he communicates. And more importantly, Rolling Stone, Newsweek, Esquire (with an 8 page profile last month) and countless other media outlets have already given him a gigantic “forum” to deliver his message. My work is trivial by comparison, so enough with the, “Your just encouraging him,” complaints. He’s already encouraged. In fact, as you’ll hear in the discussion, he’s feeling victorious. Okay, this is a perfect example of “do as I say, not as I do.” First off, the audio for me is a mess — apparently the wireless microphone they put on me was turned up too high, so you’ll hear it’s painfully distorted. You may want to turn down the volume (or off!) when I speak. Ugh. But also, on the style side, I ended up in a mad dash to make it back to the auditorium in time for the discussion (I was off meeting with other people) and threw my jacket on as I entered the building, resulting in my shirt collar sticking outside the jacket (“Don’t be such a scientist!” — read yer own book!). Oh, well, I think it’s a fun discussion which gives you a slice of Marc Morano. 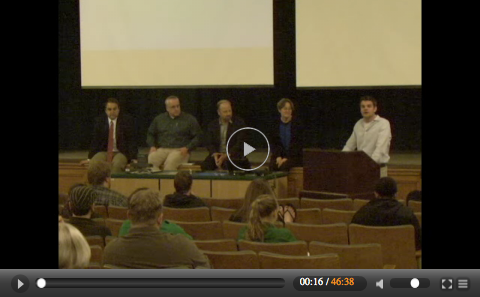 And while some people might think it’s wrong to allow a climate skeptic to speak publicly, the fact is you can hear the Syracuse students in the Q&A using the opportunity to try and grasp how the mind of a climate skeptic works — how, in the face of so much science, can you possibly claim it’s mostly untrue? If nothing else, that exercise for them was valuable because, as they said, they are deeply ensconced in an environmental program where everyone thinks pretty much exactly the same way on such major issues. It is good for them to hear a little diversity in the voices they are exposed to. Of that much I am certain. I heard this line about “the jugular” so many times after the release of my movie “Flock of Dodos.” A number of prominent evolutionists either said it to me or said it to friends: “I found the movie disappointing — I was hoping he would go for the jugular.” As if “the facts” are so incredibly powerful and devastating that there is some means of out-arguing these characters and slitting their throat with information. Let’s see … when exactly is that last time we’ve seen that in American public discourse? I can remember the one time I’ve seen a genuine jugular slitting on national television. It was the 1988 vice presidential debate between Lloyd Bentson and Dan Quayle. I was in a room with 1000 people at Dukakis campaign headquarters in Boston all watching it on giant screens. The place erupted in booming hysterical laughter when Bentson said his famous, “Senator, you’re no Jack Kennedy,” line. In fact, I just rewatched it on Youtube. You might want to as well — its only 30 seconds of video. Kind of makes you feel warm inside to see the public life of such a bozo end in a single moment. But that incident wasn’t about hitting Quayle with “the facts.” To the contrary, it was an incredibly impromptu moment that required Quayle to set it up by mentioning Kennedy, and could only have worked from a grandfatherly type character like Bentsen matched up against the boyish plebe. It was essentially a piece of theater, and captured that power of spontaneity/improv that I talked about in the first chapter of my book. Regardless, it’s the sort of dream that scientists cling on to — that some day a climate skeptic will be torched just like that in public. But it ain’t the same, and we don’t even live in the same world as 22 years ago. The best that can be done in such an unstructured evening setting such as this Syracuse event is to just keep your sense of humor present, try to make a few points, and make sure the audience doesn’t get bored to death. Which is what we did, thanks in part to the presence of Marc Morano.